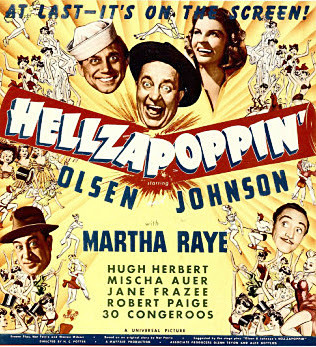 Based on the anarchistic stage play, Olsen & Johnson's HELLZAPOPPIN of 1941 is the missing link between the Marx Brothers and Laugh-In with a dash of Tex Avery added for flavoring. Black-outs. sight gags, insanity, trend-setting film tricks, it's all here! While Olsen & Johnson may lack charisma, they are the architects of this madness. Well known in it's day, it is practically unknown toay!